Organizations routinely help people adjust to their new roles and experiences through a process of socialization called onboarding. In this type of orientation, new employees are guided in their transition to effectively cope with the demands and opportunities of their new role. Then why is it that the one role all of us will assume at some point in our lives—whether we want to or not—has no deliberate socialization process? Unfortunately, the caregiver role is believed unsuitable for preparation because it is too often mistakenly viewed as . . .
Reactive—Unlike most other roles in life, people don’t dream about their care roles. We don’t preemptively think about what this experience will look like, how it will change us, what it will ask of us, or how it will change our relationships to all others. In the quiet moments of life, there seems to be little reason to collectively discuss care at the dinner table, or with family and friends. Discussions of care only seem to make it into our everyday conversations when accompanied by its partner, urgency. We dream about and talk about and anticipate love and friendship and connection but care always seems to come at us—leaving us perpetually off-balance. Outsourceable—Typically, one person is designated (or drafted) to attend to all care needs—personal, emotional, support, medical, transportation, food, shelter, safety, legal—even though the naming of a caregiver mistakenly reinforces the belief that care is an individual task rather than a collective process. Our culture’s willingness to outsource care to one individual defies the relational properties of care that expand ever-outward into all aspects of relational life. Care cannot be compartmentalized, it finds its way into every part of our lives, seeping its way into our consciousness and all of our relationships. 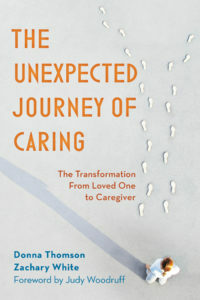 When caregiving is labeled as an individual experience, it’s no wonder that we are left unsure about how to share our experiences with those who don’t realize that care implicates us all. Whether we want to believe it or not, no one can be a mere observer when care is involved. Illegitimate—Formal roles have acronyms—MD, RN, LPN, PhD, JD, LCN—constantly reminding us of their legitimacy, purpose, and usefulness. On the other hand, informal roles are often invisible because there are no performance reviews or standards for accreditation reminding others that what is happening is real and important. Without the legitimacy of role formality, we are left without a flicker of light to sustain and guide us along our journeys. Along the way, we can’t but doubt that we are alone in our experiences as we engage in our caregiver roles without others’ acknowledgment. Everyone willingly accepts the boundaries of formal roles but when it comes to informal roles like caregiving, love and care and proximity seemingly require us to do any and all things. Temporary—The ongoing ritual of joining and shedding different roles throughout life is expected. But the care role is much more difficult to characterize because even though it is inspired by our loved one’s needs, it can’t be reducible to their condition alone. There is no “exit” interview for a care role because our care means we can’t simply leave our memories even when care may no longer be needed. Our experiences can’t help but stay with us in ways that oftentimes can’t be explained. It’s not possible to make a clean break from the care role and talk about it in the past tense because the person we cared for is hard to distinguish from whom we have become. Our orientation sessions need not wait for the urgency of care. We can begin the conversations and discussions about the caregiver role today, now, with family, friends, and in our workplaces. There is no way to fully prepare for the care role but everyday conversations will help orient us and others to the one rite of passage in contemporary life that reminds us all of our connections to one another. If all of our journeys were lit with our lanterns of care, the darkness of night would quickly transform into the light of day. It’s time we light our lanterns—for ourselves, our loved ones, and for those who will soon join us . . .
Just found your blog and love what you write. I cared for my husband for practically our whole 17 year marriage until he died this past January. He was totally disabled mentally and physically by a genetic neurodegenerative condition (FXTAS). The only help I got was from home health aides that were very very expensive. The emotional support came from the Well Spouse Assn. in which I am still very active. Otherwise, I fought this battle alone on so many levels. I love your statement “It’s not possible to make a clean break from the care role and talk about it in the past tense because the person we cared for is hard to distinguish from whom we have become.” As a widow, I miss my husband terribly; even though he spoke very little or not at all for so many years, we did love each other and God gave me the strength to keep us together till his peaceful passing at home in his own bed. I look forward to reading more of your blogs. Terri, thank you so much for sharing your experiences. I hope you find solace, support, and understanding in The Unprepared Caregiver community. Your voice and experiences matter here. This is so insightful and true. It makes me wonder about the legitimacy of the parenting role. Is something like parenting what we should aspire to as caregivers? Also, I wonder what programmes and policies could do better in preparing, ‘onboarding’ and supporting caregivers. And what is the role of the family in having these discussions? Schools? Obviously communities and government have to step up to the plate but your framing of our conception of care and caregivers has me thinking about other key partners in crafting solutions.